I've been a Wonder Woman fan since the TV show with Lynda Carter in the 1970s, and my love of the character was only enhanced in the 1980s when George Perez, my favorite artist, took her under his wing after the Crisis series and re-told her origin story. The George Perez Wonder Woman series still stands out as one of the all-time great runs in comic-book history, and Wonder Woman has been one of my favorite female superheroes (along with Supergirl, Dove, and Batgirl) ever since. When I started collecting comic-books again in December, the New 52 Wonder Woman series was therefore a fairly obvious choice. Using +comiXology to download back-issues from 2011 and later, I started with #1 and recently completed the first year, including the #0 "origin" issue from September. 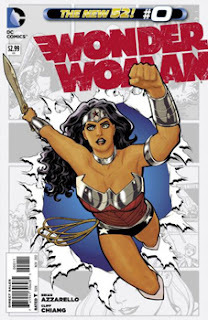 In this article, I will review the new Wonder Woman series. Depending on the writer, Wonder Woman has often stood apart from the other +DC Comics over the years because of her deep roots in ancient Greek mythology. Like Thor over at Marvel Comics, some writers lean more heavily on the mythology than others. When they do, Wonder Woman has often spent most of her time outside of the mainstream DC continuity, often to the point of seeming like the series is set in its own universe. This allowed the series to work almost as a stand-alone comic, which was a joy for casual readers of DC, like I was back in the 1980s (when I mostly read Marvel comics, but collected Legion of Super-Heroes and Wonder Woman). Comic-book companies are loathe to allow stand-alone titles these days -- apparently they think the only way to keep readers is to do one crossover after another. 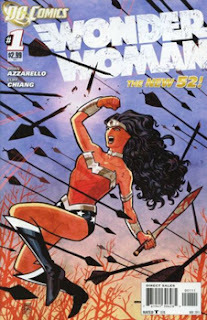 And so I did not expect Wonder Woman to stand apart in the New 52. 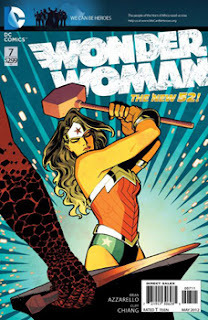 I was pleasantly surprised, therefore, to discover that Wonder Woman's writer, Brian Azzarello, has apparently been allowed to keep the Wonder Woman series essentially by itself. The character appears in Justice League like all the other DC heavy-hitters, but there has been no hint of a crossover with that series, or any other series, in the Wonder Woman issues. Indeed, there is no indication that the Wonder Woman character in Justice League is even the same person as the one appearing in her own title. Events referenced in Justice League (such as her romance with Steve Trevor) have rarely even been mentioned in Wonder Woman, and none of them have been depicted "on camera." 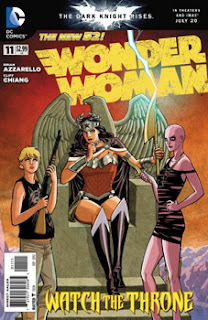 Instead, Azzarello has spent the entirety of the first year of Wonder Woman delving into Greek mythology. I have found this laser-beam focus on Diana and her own story, and Azzarello's steadfast refusal to pollute his story-line with sewage from the rest of the DC universe, to be refreshing and incredibly satisfying. Wonder Woman follows a single, continuing story-line from issue to issue, rather than self-contined 5-7 issue "story arcs" pre-configured for future "trade paperback" sale. The story is deep and engaging. The characters are larger than life but still believable. There are mysteries that last for many issues (sometimes longer than the entire first year of the series). There is a wonderful supporting cast (Hermes, Hephaestus, Lennox, and Zola). And the villains (mainly Hera, Hades, and Apollo) are well-written - cunning and cruel, but not mindlessly evil. Azzarello has also mastered the art of using flash-backs and flash-forwards to tell his story without confusing the reader -- something Grant Morrison sorely needs to learn. The reader may be in the dark about things, but is never left confused, sitting there saying "What the heck just happened?" The story has an internal consistency. It has rules, and the characters are subject to those rules. This is not to say that nothing surprising happens. But rather, when the surprising things do happen, you don't feel like the laws of time and space were violated just to present the reader with a shocking plot twist. Rather, you feel like, looking back on events, that the surprise, in hindsight, makes sense, and you can see how the story was leading up to it. Being surprising without confusing the reader is a challenging task, and Azzarello accomplishes it issue after issue with masterful skill. Brian also characterizes Diana and the other members of the cast extremely well. This is not the George Perez version of Wonder Woman, who was practically a pacifist, and who only fought when she had no choice. This is, as my friend +Stuart Johnson said recently, a "badass" Wonder Woman. Note, she is not a killer, nor is she brutal or mean. But she doesn't take crap from anyone, even the gods and goddesses, and she's not afraid to give a black eye or a split lip to someone who's asking for it. Importantly, however, those subject to Diana's wrath are asking for it, every time, enough that, as a reader, I ended up shouting "Yeah!" when I saw her lay into someone who deserved it. Azzarello did something potentially controversial in the early part of this new Wonder Woman series. The Wonder Woman legend has always been that Diana was born from clay formed by her "mother," Hippolyta, queen of the Amazons. In this new series, that is still the legend. However, after a few issues, we discover that Hippolyta lied, and that Wonder Woman is actually the product of a night of passion between Hippolyta and Zeus. This makes Diana a daughter of Zeus and basically a goddess, equal in power to any of the other Greek gods. I know some folks do not like this re-imagining of Wonder Woman's origin, but I actually do. I always thought the "clay" business was a bit strange, in the first place. And in the second place, I love that Diana is now on par with the other gods and goddesses. This basically ties her with Superman (and probably Supergirl) at the top of the "power level" hierarchy in the DC Universe. As someone who has always wanted to see more powerful female superheroes, I applaud this new direction for Diana. In addition to Wonder Woman, the other characters are equally well-drawn. Zola, the unsuspecting Virginia girl who's being chased around the universe by Hera for daring to (without realizing who he was) sleep with Zeus, is a great example. Zola's mix of innocence regarding the supernatural world of the Greek gods, and worldliness about Earth, make her someone I want to root for (and also someone I enjoy reading about). Hermes' quiet strength makes him a sure fan-favorite. And the wise-cracking, tough-as-nails Lennox, another of Zeus' recent offspring, makes the story great fun. Finally, a word about the art. I am very torn about the art in this series. For some reason, rather than having one regular artist, they seem to keep alternating between two artists - Cliff Chiang and Tony Akins. I like Chiang's style a lot, and I love the way he draws Diana's face and does her facial expressions. On the other hand, I find Akins' style blah and unimpressive. His Wonder Woman looks too childish and baby-faced for my taste. If this series had been 100% drawn by Cliff Chiang, I'd be a lot happier. Chiang does seem to be the "main" artist (he usually does the covers even if he doesn't do the inside), but I wish he would become the only artist in the future. He does a much better job with Diana, and indeed all the characters. Overall, I think the first year of Wonder Woman has been exceptional, and it is at the top of my list, along with Batgirl, Supergirl, and Justice League among the first year of DC's New 52 series. I hope they keep Brian Azzarello on this book as writer for a long time, and I hope they keep letting him tell the stories he's been telling, without interference, and without "crossover madness" mucking up the works. Please, DC, let Wonder Woman remain a stand-alone comic and allow the creative team the freedom to tell great stories. It's been a great run so far. I hope the next year is just as strong.